Evgeny Bobryshev took his third overall Grand Prix podium of the season yesterday at the Italian track of Mantova with third position, continuing his impressive run in what is his most successful year in the MXGP class. Two good starts saw him launch into the top five on both occasions, although the tight hairpin turn two bunched the field and saw him jostled down to ninth in the second race. Nevertheless, with two consistent motos aboard the CRF450RW, he finished second in race one having led the early stages, and fought back to fourth in race two to take third overall and climb the podium. 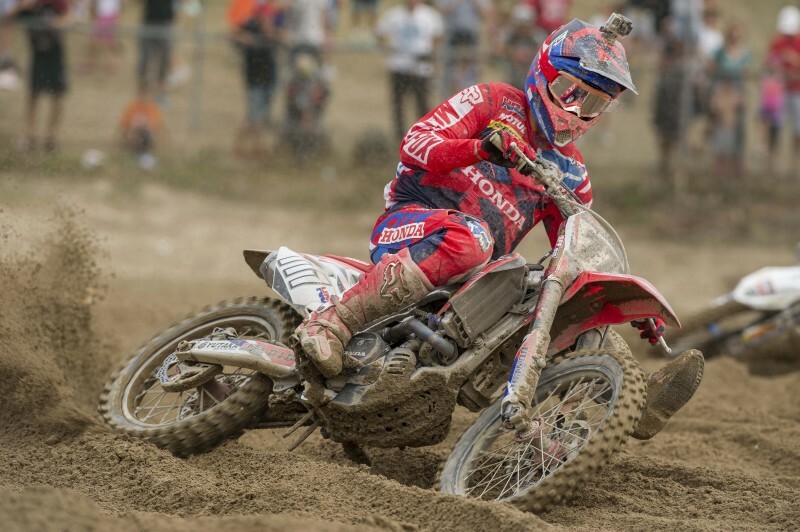 Paulin came home fifth overall, but had a more difficult day in the office. Lying fifth in race one, a small crash demoted the Frenchman to seventh although he still fought back to fourth with a big push, being the fastest man on track in the closing minutes and making the pass on the penultimate lap. Gautier’s second race was made very difficult by a crash in turn two from fourth, which demoted him to a lowly 16th. Making a remarkable return on a track where passing was very difficult, his race was blighted by another small crash whilst pushing for fifth position just nine minutes from the flag. Dropping to eighth and having to do the work all over again, GP21 crossed the line an eventual sixth. With just three Grands Prix remaining in the 2015 FIM Motocross World Championship, Gautier Paulin is second in the World standings, followed by Evgeny Bobryshev in third. With 569 points, Honda are just 36 points shy of the Manufacturers’ Championship lead.